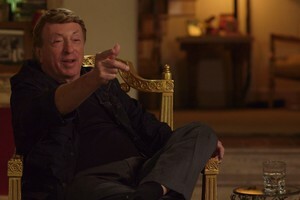 Buckle up for KING COHEN, the true story of writer, producer, director, creator and all-around maverick Larry Cohen (Black Caesar, God Told Me To, Q: The Winged Serpent, The Stuff). Told through live interviews and film and TV clips of Cohen and the people who helped fulfill his vision, along with industry icons such as Martin Scorsese, John Landis, Michael Moriarty, Fred Williamson, Yaphet Kotto and many more, King Cohen brings one-of-a-kind insight into the work, process and legacy of a true American auteur. It’s a raucous celebration of a remarkable and prolific filmmaker, who has spent over 50 years entertaining audiences without a whiff of compromise. "King Cohen is a master class in documentary filmmaking. 10/10"
"[Larry] Cohen was one of the unsung Princes of NYC Grime, live-shooting his movies in crowds in order to obtain a Hitchcockian sense of authenticity. His productions were often chaotic and unprepared, but that's what lent them such a vital spark."